As ardent chocolate lovers, we don't often recommend a treat without chocolate. 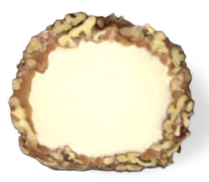 Our caramel pecan egg is the only confection we offer which is not dipped in chocolate. The flavors seem just right as they are. This wonderful vanilla fudge center which we make ourselves using Dorothy's secret recipe is dipped in luscious caramel then rolled in pecans. Honest. This is the one time we think we don't need the chocolate. Our Caramel Pecan egg is one of our best-selling Easter candies year after year.